Bollywood reveres and perpetually energizes its myths, gods, heroes and heroines, ancient and contemporary; their films pulsate, stun and elucidate audiences, Eastern and Western. The Ramayan and Mahabharata through centuries of repetition, still hypnotically enchant viewers; the movie versions keep the stories, myths, warring factions vibrantly alive. An epic film featuring “Asoka, The Great”, ruler of India’s subcontinent (268-232 BCE) the last major Emperor of the Mauryan Dynasty, starring Shah Rukh Khan and Kareena Kapoor is an historical spectacle worthy of dedication as is “Jodhaa Akbar” featuring dazzling Aishwarya Rai and Hrithik Roshan; a mixed marriage in 16-century India, Akbar, a Muslim Emperor must defend his choice of a Hindu wife; in “Mangal Pandey” (Aamir Khan) an Indian soldier in 1857 leads a revolt against the British, a step in the ultimate march towards independence. Countless films lionize the extraordinary, those who attained glory through temerity, prodigious, sweeping skill and courage. Here are two fine examples of contemporary and archival incidents where greatness was achieved through valiant devotion to righteousness. 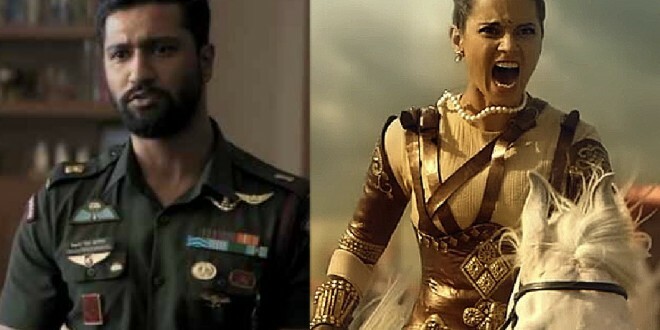 Director/writer Aditya Dhar’s “Uri: The Surgical Strike” with bullet speed and intensity captures 2016’s surgical strike (reminiscent of the Israelis’ Mossad, “Wrath of God” retaliation for the assassins involved in the 1972 Olympic massacre); Vicky Kaushal stars as Major Vihan Singh Shergill, with tremendous alacrity and impeccable timing executes the mission on the night of September 29th, 2016, in Pakistani controlled Kashmir; justified revenge, ten days after Pakistani militants claimed the lives of nineteen Indian soldiers near the town of Uri; breathlessly, surgically, the culprits are eliminated over a precisely calculated four- hour time frame. Thrilling filmmaking claims and enhances the viewing experience. Women have always been a force in Indian lore: Kali, the goddess of death, liberator of souls; Onake Obavva an 18th century combatant who fought enemies of the kingdom of Karnatkaka; Uda Devi, a fighter in the Indian Rebellion of 1857. Director Krish in “Manikarnika: Queen of Jhansi” focuses on the brief, but pivotal life of Rani Laxmibai (1828-1858); Kangana Ranaut (co-director) surpasses wildest calculations; her transformation from a joyous, fearless girl to defiant, intransigent Warrior/Queen is remarkable in its scope; epically gorgeous, an historical tale of colossal proportions, edifyingly stratospheric. Previous: PENEFLIX ANNUAL ACADEMY AWARD CONTEST 2019, SELECT AND WIN!! !